The Strait of Gibraltar (Arabic: مضيق جبل طارق‎ Madiq Jebel Tariq, Spanish: Estrecho de Gibraltar) is a narrow strait that connects the Atlantic Ocean to the Mediterranean Sea and separates Gibraltar and Peninsular Spain in Europe from Morocco and Ceuta (Spain) in Africa. The name comes from the Rock of Gibraltar, which in turn originates from the Arabic Jebel Tariq (meaning "Mount Tariq") named after Tariq ibn Ziyad. It is also known as the Straits of Gibraltar, the Gut of Gibraltar (although this is mostly archaic), the STROG (Strait Of Gibraltar) in naval use, and Bab Al Maghrib (Arabic: باب المغرب‎), "Gate of the West". In the Middle Ages, Muslims called it Al-Zuqaq, "The Passage", the Romans called it Fretum Gatitanum (Strait of Cadiz), and in the ancient world it was known as the "Pillars of Hercules" (Ancient Greek: αἱ Ἡράκλειοι στῆλαι). The Iberian Peninsula is on the left and North Africa on the right. Europe and Africa are separated by 7.7 nautical miles (14.3 km; 8.9 mi) of ocean at the strait's narrowest point. The Strait's depth ranges between 300 and 900 metres (160 and 490 fathoms; 980 and 2,950 ft) which possibly interacted with the lower mean sea level of the last major glaciation 20,000 years ago when the level of the sea is believed to have been lower by 110–120 m (60–66 fathoms; 360–390 ft). Ferries cross between the two continents every day in as little as 35 minutes. The Spanish side of the Strait is protected under El Estrecho Natural Park. On the northern side of the Strait are Spain and Gibraltar (a British overseas territory in the Iberian Peninsula), while on the southern side are Morocco and Ceuta (a Spanish exclave in Morocco). Its boundaries were known in antiquity as the Pillars of Hercules. There are several islets, such as the disputed Isla Perejil, that are claimed by both Morocco and Spain. Due to its location, the Strait is commonly used for illegal immigration from Africa to Europe. On the West. A line joining Cape Trafalgar to Cape Spartel. On the East. A line joining Europa Point to P. Almina. Around 5.9 million years ago, the connection between the Mediterranean Sea and the Atlantic Ocean along the Betic and Rifan Corridor was progressively restricted until its total closure, effectively causing the salinity of the Mediterranean to rise periodically within the gypsum and salt deposition range, during what is known as the Messinian salinity crisis. In this water chemistry environment, dissolved mineral concentrations, temperature and stilled water currents combined and occurred regularly to precipitate many mineral salts in layers on the seabed. The resultant accumulation of various huge salt and mineral deposits about the Mediterranean basin are directly linked to this era. It is believed that this process took a short time, by geological standards, lasting between 500,000 and 600,000 years. It is estimated that, were the straits closed even at today's higher sea level, most water in the Mediterranean basin would evaporate within only a thousand years, as it is believed to have done then, and such an event would lay down mineral deposits like the salt deposits now found under the sea floor all over the Mediterranean. 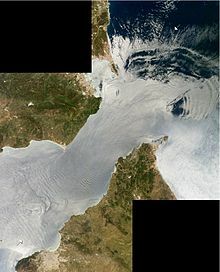 After a lengthy period of restricted intermittent or no water exchange between the Atlantic Ocean and Mediterranean basin, approximately 5.33 million years ago, the Atlantic-Mediterranean connection was completely reestablished through the Strait of Gibraltar by the Zanclean flood, and has remained open ever since. The erosion produced by the incoming waters seems to be the main cause for the present depth of the strait (900 m at the narrows, 280 m at the Camarinal Sill). The strait is expected to close again as the African Plate moves northward relative to the Eurasian Plate, but on geological rather than human timescales. The Strait has been identified as an Important Bird Area by BirdLife International because of the hundreds of thousands of seabirds which use it every year to migrate between the Mediterranean and the Atlantic, including significant numbers of Scopoli's and Balearic shearwaters, Audouin's and lesser black-backed gulls, razorbills, and Atlantic puffins. A resident killer whale pod of some 36 individuals lives around the Strait, one of the few that are left in Western European waters. The pod may be facing extinction in the coming decades due to long term effects of PCB pollution. For full articles on the history of the north Gibraltar shore, see History of Gibraltar or History of Spain. For the full article on the history of the south Gibraltar shore, see History of Morocco. Evidence of the first human habitation of the area by Neanderthals dates back to 125,000 years ago. It is believed that the Rock of Gibraltar may have been one of the last outposts of Neanderthal habitation in the world, with evidence of their presence there dating to as recently as 24,000 years ago. Archaeological evidence of Homo sapiens habitation of the area dates back c. 40,000 years. Beginning in 1492, the straits began to play a certain cultural role in acting as a barrier against cross-strait conquest and the flow of culture and language that would naturally follow such a conquest. In that year, the last Muslim government north of the straits was overthrown by a Spanish force. Since that time, the straits have come to foster the development of two very distinct and varied cultures on either side of the straits after sharing much the same culture and greater degrees of tolerance for over 300+ years from the 8th century to the early 13th century. On the northern side, Christian-European culture has remained dominant since the expulsion of the last Muslim kingdom in 1492, along with the Romance Spanish language, while on the southern side, Muslim-Arabic/Mediterranean has been dominant since the spread of Islam into North Africa in the 700s, along with the Arabic language. For the last 500 years, religious and cultural intolerance, more than the small travel barrier that the straits present, has come to act as a powerful enforcing agent of the cultural separation that exists between these two groups. Following the Spanish coup of July 1936 the Spanish Republican Navy tried to blockade the Strait of Gibraltar to hamper the transport of Army of Africa troops from Spanish Morocco to Peninsular Spain. On 5 August 1936 the so-called Convoy de la victoria was able to bring at least 2,500 men across the strait, breaking the republican blockade. The Strait is an important shipping route from the Mediterranean to the Atlantic. There are ferries that operate between Spain and Morocco across the strait, as well as between Spain and Ceuta and Gibraltar to Tangier. In December 2003, Spain and Morocco agreed to explore the construction of an undersea rail tunnel to connect their rail systems across the Strait. The gauge of the rail would be 1,435 mm (4 ft 8.5 in) to match the proposed construction and conversion of significant parts of the existing broad gauge system to standard gauge. While the project remains in a planning phase, Spanish and Moroccan officials have met to discuss it as recently as 2012, and proposals predict it could be completed by 2025. Through the strait, water generally flows more or less continually in both an eastward and a westward direction. A smaller amount of deeper saltier and therefore denser waters continually work their way westwards (the Mediterranean outflow), while a larger amount of surface waters with lower salinity and density continually work their way eastwards (the Mediterranean inflow). These general flow tendencies may be occasionally interrupted for brief periods by temporary tidal flows, depending on various lunar and solar alignments. Still, on the whole and over time, the balance of the water flow is eastwards, due to an evaporation rate within the Mediterranean basin higher than the combined inflow of all the rivers that empty into it. At the strait's far western end is the Camarinal Sill, the strait's shallowest point which limits mixing between the cold, less saline Atlantic water and the warm Mediterranean waters. During the Second World War, German U-boats used the currents to pass into the Mediterranean Sea without detection, by maintaining silence with engines off. From September 1941 to May 1944 Germany managed to send 62 U-boats into the Mediterranean. All these boats had to navigate the British-controlled Strait of Gibraltar where nine U-boats were sunk while attempting passage and 10 more had to break off their run due to damage. No U-boats ever made it back into the Atlantic and all were either sunk in battle or scuttled by their own crews. Internal waves (waves at the density boundary layer) are often produced by the strait. Like traffic merging on a highway, the water flow is constricted in both directions because it must pass over the Camarinal Sill. When large tidal flows enter the Strait and the high tide relaxes, internal waves are generated at the Camarinal Sill and proceed eastwards. Even though the waves may occur down to great depths, occasionally the waves are almost imperceptible at the surface, at other times they can be seen clearly in satellite imagery. These internal waves continue to flow eastward and to refract around coastal features. They can sometimes be traced for as much as 100 km (62 mi), and sometimes create interference patterns with refracted waves. Except for its far eastern end, the Strait lies within the territorial waters of Spain and Morocco. The United Kingdom claims 3 nautical miles (5.6 km; 3.5 mi) around Gibraltar on the northern side of the Strait, putting part of it inside British territorial waters. As this is less than the 12 nautical miles (22 km; 14 mi) maximum, it means, according to the British claim, that part of the Strait lies in international waters. The ownership of Gibraltar and its territorial waters is disputed by Spain. Similarly, Morocco disputes Spanish sovereignty over Ceuta on the southern coast. Some studies have proposed the possibility of erecting tidal power generating stations within the strait, to be powered from the predictable current at the strait. Chisholm, Hugh, ed. (1911). "Gibraltar" . Encyclopædia Britannica. 11 (11th ed.). Cambridge University Press. p. 938. ^ Google Books Ngram Viewer results "Strait of Gibraltar/Gut of Gibraltar"
^ See, for instance, Nato Medals: Medal for Active Endeavor, awarded for activity in the international water of the Mediterranean and STROG. ^ Tremlett, Giles, "Moroccans seize Parsley Island and leave a bitter taste in Spanish mouths", in The Guardian, 13 July 2002. ^ "Migration Information Source – The Merits and Limitations of Spain's High-Tech Border Control". Migrationinformation.org. Retrieved 2011-07-15. ^ "BirdLife Data Zone". datazone.birdlife.org. Retrieved 2019-02-23. ^ editor, Damian Carrington Environment (2018-09-27). "Orca 'apocalypse': half of killer whales doomed to die from pollution". The Guardian. ISSN 0261-3077. Retrieved 2019-02-23. ^ "Last of the Neanderthals". National Geographic. October 2008. Retrieved 2009-12-29. ^ "Europe-Africa rail tunnel agreed". BBC News. ^ "Tunnel to Connect Morocco with Europe". bluedoorhotel.com. February 17, 2012. ^ "U-boat war in the Mediterranean". uboat.net. Retrieved 2011-07-15. ^ Wesson, J. C.; Gregg, M. C. (1994). "Mixing at Camarinal Sill in the Strait of Gibraltar". Journal of Geophysical Research. 99 (C5): 9847–9878. Bibcode:1994JGR....99.9847W. doi:10.1029/94JC00256. ^ "Atlantropa: A plan to dam the Mediterranean Sea". Xefer blog. 16 March 2005. Retrieved on 13 August 2012. Wikimedia Commons has media related to Strait of Gibraltar. "Solitons, Strait of Gibraltar". NASA Earth Observatory. Retrieved 2006-05-24. "Internal Waves, Strait of Gibraltar". NASA Earth Observatory. Retrieved 2006-05-24.